First, make sure that the printer is on. When a printer is on, it should have some light or LED(usually green) indicating it’s receiving power. If you do not have any indicator light, make sure the printer is connected to a working power outlet by verifying each end of the power cable. Next, press the printer power button. If after doing the above steps, the printer still does not display a power status indicator light, you have a serious printer issue and we suggest contacting the printer manufacturer for repair or replacement. Your printer should have two cables connected to it: the power cable and the data cable. Make sure the power and data cables (parallel cable or USB cable) are connected to both the printer and computer. After your printer has completed its initial startup, you should see a solid colored light. If the indicator is blinking or is orange, often this is an indication of a printer error, like a paper jam or an issue with the ink or toner cartridge. As there are not standards for all printers, if you see a blinking light, visit the manufacturer’s site or review the printer manual for specific error details. Without paper, your printer will not be able to print. Make sure you have paper loaded into the printer paper cartridge or tray. Next, verify that no printer paper is jammed or partially fed into the printer. If you suspect paper is stuck somewhere it shouldn’t be,refer to our help page for paper jams. Often when you’re encountering an ink related issue, your printer status indicator light (mentioned above) should be flashing. If this is not occurring, you may want to skip to the next section. However, if you’ve recently inserted a new ink cartridge, you may want to try the below suggestions. Most printers have a way of printing a test page. A printer test page allows you to determine if the printer is working. The printer self test is usually accomplished by holding down a series of keys. If you are not sure if your printer has this feature or how to perform it, refer to the printer manual or visit the printer manufacturer’s website. 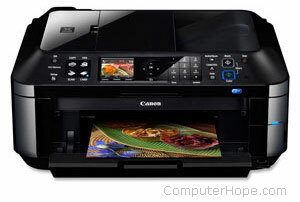 You can also perform a software self-test to determine if the computer can see the printer and it’s able to print. Follow the steps below to perform this test. Click or double-click the Printers, Printers and Fax, or Devices and Printersicon. Right-click on the printer you want to test and select the Properties or Printer Properties option. If you do not see your printer listed, your printer is not installed. In the printer’s Properties window, click the Print Test Page button. If the printer can print a test page, your printer is installed and set up properly. However, if you are unable to print in other programs, the program you are attempting to print from likely has issues. If you are running an older printer and MS-DOS, Windows 3.x, Windows 95, Windows 98, or Windows NT, you can also attempt the below software test. The above should take the directory listing and print it to the printer. If this does not print, refer to your operating system troubleshooting section. Note: The above command does not do a paper feed, so you need to press your FF or PP options on the printer, or you can try manually ejecting the paper. If your printer does not have any flashing lights and is connected properly, it’s possible you may be encountering a driver related issue. We suggest visiting our printer driver listing, which links to all major printer manufacturer driver pages, and download the latest drivers for your printer. If the printer you’re connecting to the computer is an LPT (parallel port) printer, we also suggest verifying the below settings if your printer is not working. Enter the computers CMOS setup. Once in CMOS, verify that your parallel port is enabled or installed. Next, verify the printer or parallel port mode. If your parallel port is set to ECP mode, we suggest trying a different mode. If you have a parallel printer with other parallel devices, such as a parallel scanner or zip drive, temporarily disconnect these devices to verify they are not causing issues with your printer.